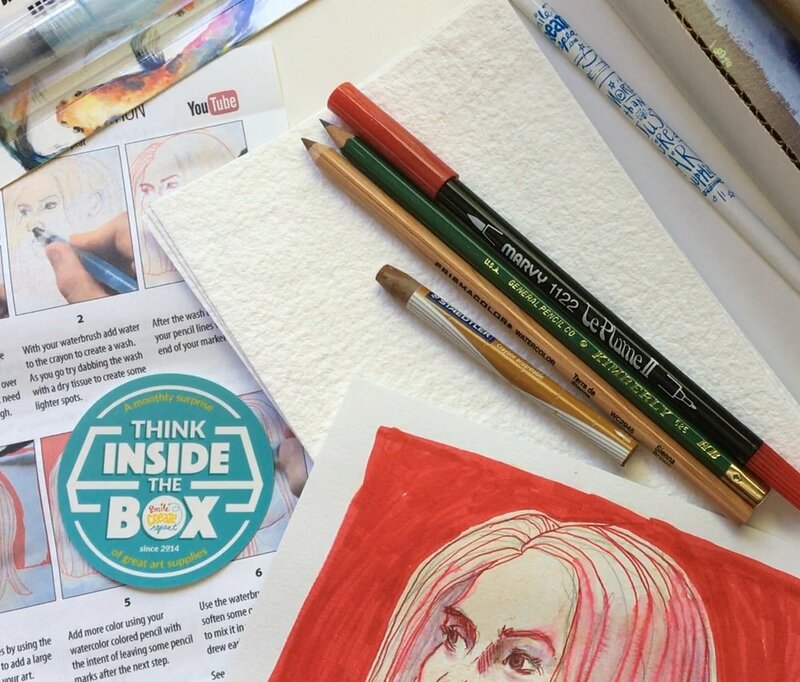 Smile Create Repeat is a monthly art supply subscription box delivering 5 or more artist quality art supplies plus an art lesson, demo, and more! Join today and receive a free welcome box ($30 value) with any 6 or 12 month subscription. Start creating today with your Welcome box that ships free right away! Order a 6 or 12 month subscription today and start creating right away with your Welcome box ($30 value) ships free! Ready to start today? We have a special offer for you. Order a 6 or 12 month subscription and receive your FREE Welcome Box! What’s in my Welcome box? 5+ quality art supplies, art lesson, art demo, and so much more! There’s no waiting, it ships right away! It’s simple- order a 6 month subscription- receive 7 boxes over the next 6 months ($50 savings). Order a 12 month subscription- receive 13 boxes over the next 12 months ($90 savings). More time creating. More time smiling. Each monthly surprise of great art supplies includes so much more than just the quality tools that professional artists and illustrators use. You also get fun extras, tips, lessons, step-by-step demonstrations and inspiration to help you create, become a better artist and have fun. Plus free shipping–that's a $5 a month savings. So you can create when you receive your surprise and all month long. Including tool specific surfaces to work on which may include specialty papers, canvas or panels. You are getting the right supplies to make the best art you can. No cotton balls or Popsicle sticks allowed and no wasted time searching and then not knowing if you bought the right supplies. With Smile Create Repeat you do get the right supplies! what do i do with these supplies? Follow the included step-by-step lesson to explore your new supplies and create amazing art. Or just create anything you'd like and maybe learn a little something new with the tips and tricks. Visit our YouTube channel and watch a new demonstration video each month. These videos take you from start to finish using the supplies in your surprise. Tony (co-founder of SCR and a professional artist, illustrator and designer) shares his process and mistakes for creating and some insights as to why he chose the specific supplies. Join us today- your Welcome Box is waiting for you!